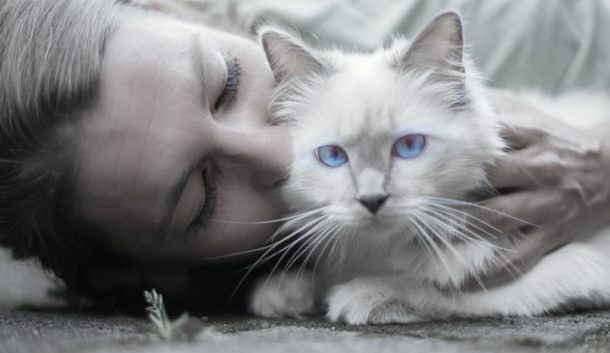 Have you heard of the Minskin cat breed? If not, don’t worry, I’m going to tell you everything you need to know about this darling munchkin/sphynx mix. Read on to learn where he came from, what his personality is like, and more. We’ll also touch on any ethical concerns surrounding this particular designer cat breed. By the time we’re done, you’ll know whether this is the right cat for you. The Minskin cat breed is what you get when you take a munchkin cat and a Sphynx, then toss in a little Devon Rex and Burmese. It’s a designer cat breed in the truest sense of the word. Let’s start with a little history, then we’ll move on to temperament and health. First, check out this video from Animal Planet, it gives you a good overview! The munchkin/sphynx mix is a pretty new cat, with its Boston roots dating back barely ten years. See, cat breeder Paul McSorley decided that he wanted to design a cat that had similar color patterns as the Siamese (just on the ears, legs, tail, and a “mask-like” pattern on the face).. He also wanted said kitty to have short legs, like his Munchkin cats. So, he got to work mixing and matching his Munchkins with the sphynx cat, then adding in some other breeds until he finally succeeded about two years later. By 2000, the first Minskin cat, “TRT I Am Minskin Hear Me Roar” (shortened to “Rory”) was born. About 5 years later, about 50 more Minskin cats were registered with TICA. Just over 10 years ago in 2008, TICA recognized the Minskinas a “Preliminary New Breed,” where he’ll stay until TICA decides he meets all requirements to move on to full recognition. The Cat Fancier’s Association, FYI, doesn’t recognize munchkin cats because of the ethical concerns, so the Minskin will most likely never make it to their breed list. 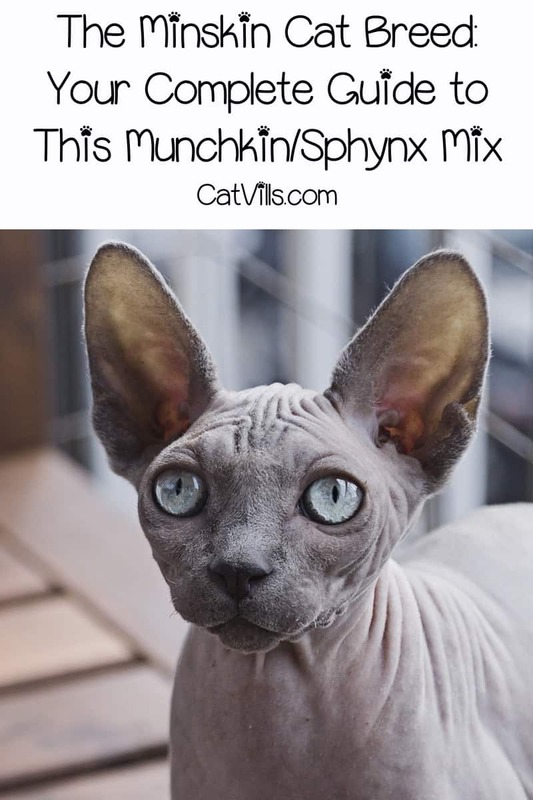 The Minskin looks exactly like you would imagine a cross between a sphynx and a munchkin would. His legs are short and his fur is even shorter (practically non-existent across much of his body). His front legs are actually shorter than the back, but this doesn’t keep him from leaping with the best of them. The Minskin has been compared to E.T., and it’s easy to see why! He has large eyes, a round head, and a wrinkly face. I actually think he looks more like Dobby with those big ears! Here’s an interesting fact for you: while the Minskin looks hairless, he actually has hair all over his body. It’s just very, very short and downy. However, as McSorley envisioned, he does have thick points of hair on his mask, ears, legs, and tail. Now that you have a good overview of their history and general appearance, let’s learn more about the Minskin’s personality and health. Since the Minskin combines several breeds that are known for being friendly and affectionate, the breed as a whole is pretty easy-going and snuggly. They love playing and get along well with kids, other cats, and even dogs (provided the dog also gets along with cats, of course). Like their parents, Minskins are super smart and will definitely keep you on your toes! They may be small, but they use that big (figuratively speaking) brain to do everything that their larger counterparts can do. While the Minskin is outgoing and friendly, he does have a hard time adapting to change, so keep that in mind if your family is constantly in flux. He’s a good breed for a settled life, not for one that’s always on the move. I'm ready for the trick or treaters next week. This is where ethical concerns come into play, and why Cat Fancier’s won’t even recognize munchkin cat breeds. \While the Minskin is, so far, relatively healthy, the breed hasn’t even been around for one entire lifespan of the average cat, so it’s hard to really say what to expect in the future. So far, though, the Minskin doesn’t seem any more prone to major health issues than other munchkin breeds, or even other cats as a whole. Potential health problems can stem from one or more “parent” breeds, so let’s break it down a bit. Munchkins are more likely to suffer from spinal problems in general, and lordosis, a painful and potentially fatal spinal condition, in particular. It’s not unique to Munchkins, but they are more prone to it than their full-size counterparts. Higher risk of sunburn, and in turn, skin cancer. Potential to contract yeast infections. Higher susceptibility to cold weather. Of course, if you keep your minskin indoors, you can easily avoid most of those potential skin problems. The Spyhnx is also more prone to heart problems, specifically hypertrophic cardiomyopathy, a condition that causes an enlargement of the left heart ventricle. Unfortunately, the Devon Rex, another breed used in the creation of the Minskin, is also prone to this condition. If you’ve decided that you absolutely must have a Minskin cat, it’s important to go through a highly reputable breeder. TICA usually has a list of good breeders for experimental breeds, but right now they don’t have any listed for the Minskin. In fact, I can’t find a single site that has a list of reputable breeders, perhaps because it’s such a new breed. Your best bet is to talk to join breed-specific Facebook group and ask for help. People in these groups are passionate about the breed, so they won’t steer you wrong. I love that costume! I had no idea that Minskin was a breed. I have some concerns about the breed from an ethical standpoint, but mostly I just want cats and dogs to be healthy and cared for. Very unique looking breed, indeed. The eyes are stunning! I was wondering if the cats were intolerant of cold weather and sure enough, I see you noted that they have a higher susceptibility to cold weather. It certainly makes sense. I wouldn’t know what to do with a cat that is pretty easy-going and snuggly. My cat does not want to be touched ever. She’s going to get a surprise when I bring a Minskin home. This is such a unique breed. I do wonder how they came into being. Oh fab! There are so many breeds now because of the experiment of people. If I’d want a cat, I will choose this, so cute! I have heard of this breed, and I think they’re adorable. I would honestly love to have one of these cats. They’re so cute! I didn’t really know much about these cats before. This is some great information though. Thanks for sharing.